Day 75 - My biggest EVER 'Make'! For the past 3 years I've been living in a house with my husband that needed COMPLETE renovation. We started with the electrics and the heating and guttering, then moved on to the bedrooms and the bathroom and FINALLY it's the turn of my kitchen (I say my because lets be honest, it is!). Being from Lewisham, and having grown up in a council flat, I really couldn't moan about the dated galley kitchen that was here before - it had plenty of work surface, cupboards and a cooker, but it was absolutely freezing, and whenever people came over to eat I'd be stuck in the kitchen cooking like Cinderella on my own while they sat chatting and laughing whilst gulping the wine in the diningroom. It took us a lot of hard graft and arguments to get it to where it is now, and we were helped by a great builder - Tony Chard. My new BFF is the black handsome beauty in the background.. please give a warm welcome to Arthur the Aga. He's not a 'real' Aga he's more a range cooker, so has 2 electric ovens on the bottom, a slow cooker top left, and a grill top right. He has gas hobs with a long one in the middle for a griddle pan.... I'm off to play with him! OK, OK! I know this is originally from Philadelphia and not a true British thing, but ask anyone over the age of 30 if they remember ice cream floats when they were younger and I'm sure they'll smile and say it was a part of their British childhood. I distinctly remember my Granddad making me my first one with cream soda and a rich clotted vanilla ice cream. I recreated it today after a good few years and the first taste and the froth bought back so many good memories. 1. Any fizzy drink you like - though cream soda, coke or cherryade are the best! 3. get a long spoon and give it all a good dig around, eating the ice cream and slurping as you go. Fortnum & Mason claims to have invented the Scotch egg in 1738. They came up with is as a way to enjoy food on the move in the new horse drawn carriages, and now they're a firm British picnic favourite. I stupidly made a batch up one summer when we went to the park with a few friends and their kids, and now every time we see each other for a get together/buffet, I'm asked to make them (I don't mind really!) So, inspired by Heston's recipe with Waitrose, here's a link to my version and recipe of the Scotch egg. Sticking with British pie week, today I made a homely fish pie.... thankfully no pastry topping to give myself a break, and instead a rich creamy mash. A traditional British dish, fish pie is usually made with white fish and a white sauce, made using the milk the fish was poached in. Prawns and hard boiled eggs are also often added. Some use a pastry casing, but mashed potato as a topping is the most common form, with a grating of cheese on top to brown it off and make it all lovely and crispy. it is also referred to as a Fisherman's pie - mainly because it's similar to a Shepherds pie, but uses fish instead of meat. 2. Roughly chop the onions and pop them into a heated pan. Continue to cook until the onions are nicely softened. In the mean time, you can make up your white sauce. 3. Add to the onions your white wine and plenty of seasoning. 5. Scatter the boiled eggs over the top of the fish mixture and then carefully spread the mashed potato over the top of the dish so that everything is covered. Taking a fork, prick at the potato to make small peaks – these will crisp up in the oven and give a lovely golden topping. 6. Sprinkle over your grated cheese and then put the dish into a pre-heated oven (gas mark 6) for approx half an hour – or until you can insert a knife to the centre of the dish and then when it comes out, it’s boiling hot. Slow cooking is one of the most common forms of British cooking. We're a nation that's always liked to use every bit of an animal, and slow cooking is the only want to get the most out of it and ensure it's actually edible. Once an extremely cheap cut of meat that would often be thrown away or just used for stocks and soups, shin of beef is trendy again on the British menu. Although this is great for the animal in that we're once again open to utilising it all, it also means that the prices have been pushed up, and in the same way that Oxtail was once a cheap cut, we're now paying premium for both. Anyway, here's my recipe for a very easy, perfect Sunday afternoon slow cooked shin of beef. 2. Transfer the meat to a casserole dish, add in all of the thyme, tomatoes, wine and garlic. 3. Season well, bring to the boil on the hob and then add on a tight lid and place it in the oven at 90 degrees for 3 hours. 5. Serve on a big platter dish with oodles of mash potato and a big spoon to soak up the juices. 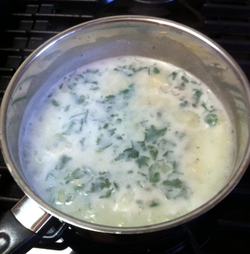 I like to add tarragon to my Cullen Skink - it's by no means traditional, but I think it goes really well with the smoked haddock. (P.S) take no notice of the pale nasty looking pic- this was taken before completely cooked! 2. Add the potatoes, tarragon, bay leaves and milk, give a good stir, then cover with a lid and leave to simmer for 20 minutes. 3. Remove the lid, add in the haddock, replace the lid and simmer for a further 5 minutes. 4. Remove the lid and cook for a further 5 minutes, or until the potatoes are completely soft and the fish cooked through. 5. Season and ladle in to nice big soup bowls. Day 58 - Don't try this at home kids!! 'Cobblers' originate from the early British American colonies, where English settlers covered a stew filled dish with biscuits or dumplings. 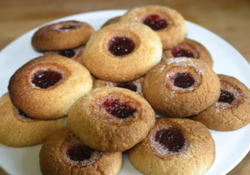 They can be sweet or savoury, and the name comes from the appearance, as it is said to look like a cobbled street. Others believe that it's due to the fact that the ingredients are 'cobbled' together. In Britain during the Second World War, Cobblers were promoted by the Ministry of Food as they don't have a base and so used less butter than a traditional pie or pastry, and were incredibly simple to make from left over meats and vegetables. Instead of topping with the traditional scones, or dumplings, I have opted to make mine with a pork sausage and vegetable filling, and topped with broken up uncut white bread, soaked in a little oil and fresh sage to give it a crispy and even simpler crunch. 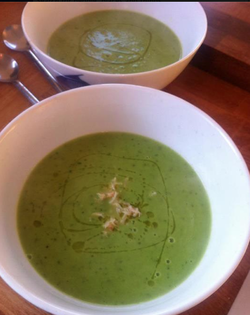 Day 41 - The Great British Pantry Supper Club! 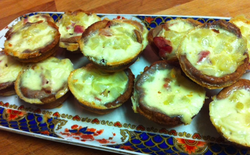 Taking inspiration from Wales today - I decided to make a leek, bacon and Welsh goats cheese tart. I used the stock from some slow roast pork cooked in cider that gave it a rich and slightly sweet taste and some ready made, ready rolled short crust pastry (if Jmes Martin says it's OK then I think it's OK!) These little beauties were gone within minutes. The traditional version is of course 'Beef Wellington' but my husband recommended a while ago that I give them a whirl using lamb necks instead of beef - it was a resounding success. Infact I'd go so far as to say that I think this version is even better than a traditional beef wellington (and works out a bit cheaper due to lambs necks being far cheaper to beef fillet!). The history of Beef WellingtonI have come across three different reasons as to where this dish originate from, and why it was named 'Wellington'. I think my favourite is that it was supposedly named after a particularly shiny pair of wellington boots, which were shaped like the the beef when it was first cooked. Others suggest that it was named after the winner of the Waterloo battle in 1815, (Arthur Wellesley, the Duke of Wellington). One of his cooks, wanting to honor the Duke, is said to have created this dish to serve him one night at dinner. The final theory is that it is in fact of Irish origin, and should be called 'Steig Wellington'. Whichever the correct story, I'm just pleased that the British have embraced it, and that it made a come back in the 60s thanks to President Nixon. 1. Roughly chop the mushrooms, rosemary and anchovies, and place in a food blender with salt and pepper. Blitz until it's turned to a thick pulp. 2. 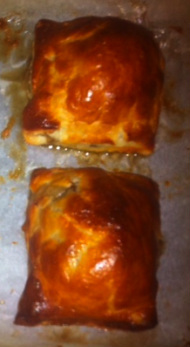 Roll out the pasty and smear the mixture, around half a centimeter thick in to the middle. 3. Place the lambs neck in the middle of the mixture and then roll the pasty over so that the lamb has an even coating of the mixture, and the whole lot is completely covered with pastry. Where would us Brits be without our British roast? it's a time for family and friends to gather around the table and enjoy the labours of the chef, tucking in together to carve the meat and fight over the crispy potatoes. What once was traditionally a British meal is now served served up and loved in the US, Canada, Australia, New Zealand and Ireland. 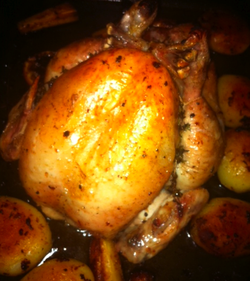 Today we enjoyed roast chicken - enhanced with lemon and thyme. According to Wikipedia, there are two theories as to where the Sunday roast originated from - the first being that during the industrial revolution, Yorkshire families left a cut of meat in the oven before going to church on a Sunday morning, which was then ready to eat by the time they arrived home at lunchtime.The second opinion holds that the Sunday Roast dates back to medieval times, when the village serfs served the squire for six days a week. Then on the Sunday, after the morning church service, serfs would assemble in a field and practice their battle techniques and were rewarded with a feast of oxen roasted on a spit. My Mum taught me a great trick to keeping a chicken moist when it's roasted - and that's to stick an unpeeled potato up its bottom... it works every time, and so here I've substituted it for a lemon to keep the moistness but also to inject a little flavour. 2. Peel the zest & pith from the lemon, then insert the whole thing in to the cavity of the chicken along with 2 sprigs of fresh thyme. 3. Cover the chicken in olive oil, salt and pepper and then rub it in well with your hands so that the all skin is covered. 4. Slice the second lemon in to circles around 2cm thick and lay them on the bottom of the roasting tray. Position 2 sprigs of thyme on top and then sit the chicken on top of this. 5. Tuck the remaining sprigs of thyme in to each of the chicken legs, and pop in to the oven on gasmark 6 for 30 minutes - baste after 15 minutes. 6. Position the potatoes around the edge of the chicken and ensure they are covered in the oil and juices. Cover the top of the chicken with a little foil to prevent it from burning, then place back in to the oven for a further hour, basting every 20 minutes. 7. Remove the foil from the chicken, return to the oven for a final 15 minutes with the heat turned up to Gasmark 7 and then check that there is no blood running out of the chicken before carving and serving with steamed veg and gravy. 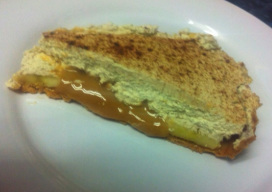 Day twelve - Banoffee pie! I was really surprised - and VERY pleased, to find out that banoffee pie was English - for some reason I always thought that it was American?. My boss told me that he used to work in a pub called the Hungry Monk in East Sussex when he was younger, and that they had invented it, but I didn't really believe him until I found the information on Wikipedia. So, what better way to finish off dinner than with a great British banoffee pie! Ian Dowding and Nigel Mackenzie at The Hungry Monk restaurant in Jevington, East Sussex are said to have invented the dessert in 1972, having been inspired by an American dish known as "Blum's Coffee Toffee Pie", which consisted of smooth toffee topped with coffee-flavoured whipped cream. Dowding adapted the recipe to instead use the type of soft caramel toffee created by boiling condensed milk, and worked with Mackenzie to add a layer of bananas. 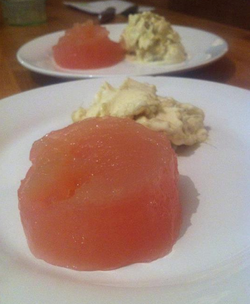 They called the dish "Banoffi" and it was an immediate success. Interestingly, when buying or making banoffee pie, it seems to not include the coffee element, and we tend to use a crunchy biscuit base instead of pastry - but here I've made it to their true original recipe and it is reeeeeeeallly good! Visit the Hungry Monk website for their unique and original recipe. It seems as though our winter has finally arrived, and so what better winter warmer to enjoy than a good old cottage pie. It's so easy to make and it's always a favourite in our house - a) because I can make it in advance and just pop it in the oven while we're out walking the dog - the pic I've shown was taken before it got popped in to the oven to crisp and brown, and b) because 'the husband' always wants to go back for seconds, and the dog (Jack - our gorgeous chocolate labrador baby) likes to eat whatever mash and meat filling that won't fit in to the dish before baking. Interestingly, I've never followed an actual recipe for making cottage pie - it's a bit like Spaghetti Bolognese in that I just seem to have instinctively known what goes in to it. I did have a hunt through my various 'British' cook books to see whether there's a traditional recipe but alas I couldn't find one anywhere... not even for Shepherds pie (it's lamby cousin!) so an internet search showed various finds from James Martin, Delia and a few recipes passed down from Great Great Grandmothers - and it seems that i have, thankfully been using the same ingredients and techniques as the rest of Britain. 'Cottage' used to mean a modest dwelling for rural workers, and due to potato being introduced as an affordable, edible crop for the poor in 1791, it was a way of making a cheap wholesome dinner from any left over roasted meats. 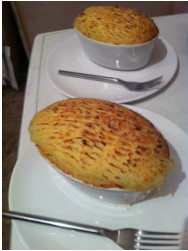 Its lamby cousin, Shepherd's pie followed in 1877. It used to be made with a layer of potato on the bottom, as well as the top of the dish but nowadays we just tend to put it on the top, forming a nice crunchy golden crust. 2. Fry the onion and chopped carrots in the oil until soft, then add in the minced beef and cook until browned. 3. add in the thyme, bayleaf, stock and puree and leave to simmer for 30 minutes, or until the liquid has been absorbed. 4. Season to taste, and then remove the bayleaf and thyme. Stir in the peas. 5. Take a deep oven proof dish and spoon in the mixture until 2 thirds full. 6. Mash the potato with some butter, salt and milk then smooth it on top of the meat to cover the dish. 7. Place in the oven on gasmark 6 for 30 minutes - or until the centre is cooked through and the top has nicely browned. Tea? grown in England?? yes, it is! OK - so maybe not in large quantities like your PG Tips and Yorkshire tea variety, but Tregothnan in Cornwall produces the first and only tea grown in England. Tea is the second most consumed beverage in the world (after water), and it's considered our national drink in Britain. We Brits won't discuss anything without first sitting down to a 'nice cup of tea' - and we have many debates around how it should be served - cup or mug, one lump or two, milk first or milk last... Infact in the recent poll that I ran here on the site, 36% of you thought that milk should go first, and 56% thought that it should be added after the tea going in the cup. I have to admit that I am part of the minority, the reason being that I like to be able to see how strong/weak the colour of my tea is before I remove the bag and if the milk doesn't go in until after, it's impossible to do that. A Facebook 'Cooking Friends' member helpfully got in touch, informing me that the reason people put milk in first, is that when bone china cups were invented and 'posh' people had them, they were too fragile to take direct heat and so had to have milk added first, and this is when it started to change. 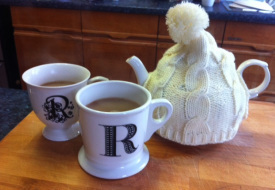 Regardless of our different tea making rituals, I think there's one thing that we can all agree on - it's always better when someone makes a cup for you... so go on, put the kettle on! 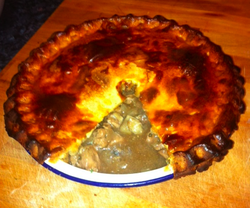 I've never made game pie before, infact the only game that I've ever cooked has been Venison, and a roast pheasant. But, inspired by 'The Modern Cookery Book' that I picked up, and the game that was on offer at Polehill yesterday, I thought I'd give it a go... and it did not disappoint! A lovely rich shortcrust pastry (homemade - but shop bought from Polehill in their freezer department - James Martin says it's OK to buy pastry, so that's good enough for me! ), and succulent, rich meat with mushrooms and a silky rich gravy. I served ours with a mix of mashed potato, kale and onion. Game pie dates back to Roman times, and reached their most elaborate in Victorian England. The best meat was reserved for the wealthy, whilst servants ate pies made of left-over "umbles" - heart, liver, tripe and other offal, hence the term "eating humble pie". 1lb shortcrust pastry, Mixed game, 1 gammon rasher of baco, Pinch of mace,6 white button Mushrooms, Sprig of parsley, grated rind of 1 lemon, 1 teaspoon flour, chicken stock, 1 beaten egg. 1. Put the game in to a large saucepan with the bacon cubes, chopped onion, mace, parsley and lemon rind. 2. Cover the meat with the stock, and season, bringing the mixture slowly to the boil. 3. Simmer for 1 hour, or until the meat is tender, then making a roux of the flour with a little stock, add this to the mix and cook for a further 10 minutes. 4. Turn the mix in to a bowl and leave to cool, whilst frying off the mushrooms in a little butter - then leave these to cool also. 5. 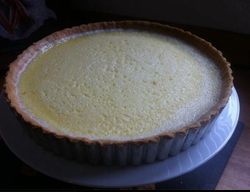 Live a pie dish with the pastry, then once the filling is cold, spoon it in to the pastry. 6. Cover the top of the pie with the rest of the pastry, squeeze around the edges, and then glaze the top with the beaten egg. 7. Pop in to the oven on Gasmark 6 for 45 minutes, or until golden brown and the pastry is cooked through. Enjoy, with a nice glass of red wine. I've just noticed that there's a bit of a sausage theme going on with the 'make' page, so I'll have to rectify that with a British craft (suggestions?!) or a British fish dish shortly. My delicious pork sausages were once again from Court Farm, and the recipe for my batter came from a 1960's edition of the 'Good Housekeeping Cooking Compendium' which has a highly entertaining introduction about 'housewives' and 'daughters-at-home' not being able to even cook a simple egg. So, I tried out their version of a traditional British batter, and I have to say that it did turn out perfectly - slightly spongy and chewy in the middle with a nice crispy golden crust on the outside, The perfect accompaniment to any great Toad in the Hole has to be a good old onion gravy, and I added a few of my leftover Summerset mushrooms to this, along with 'Bisto' gravy (it's Wednesday night, and I've had too long a day at work to be making gravy from scratch!) with a large spoonful of Tomato Chilli Jam from The Great British Pantry. A traditional English dish that consists of sausages and batter, which actually dates back to an recipe in 1861 whereby cheap cuts of meat were used instead of sausages at the end of the day, and so was first called 'English cooked-again stewed meat'. 1. Sieve the flour and salt into a bowl, then make a well in the centre and add the eggs. Mix them in, until the eggs are soaked up 2. Slowly add in the milk, beating with a wooden spoon, until all of the milk is combined and you have a lump free silky mixture. 3. Beat for approximately 5 minutes, getting plenty of air in to the mix, then leave on the side for 20 minutes to stand. 4. 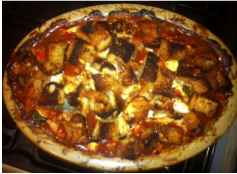 Heat some oil in a baking tray, in the oven on gasmark 6, along with your sausages for 10 minutes. 5. Remove the sausages from the oven, place them with equal distance apart, and then pour over the batter mix. 6. Return to the oven, and cook for 25 minutes - or until the batter has risen, is golden brown, and cooked in the middle. 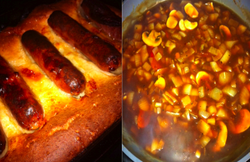 Enjoy - with lashings of onion gravy and some nice creamy mashed potato. Day One - The Great British Fry up! And so, 'The Great British Challenge' begins! and what better way to start the new year, than with a good old British fry up to help get over the New Year's Eve hangover. Everything on the plate is British... bar the tomatoes. If anyone can help me to find British tomatoes in January, please please please get in touch and let me know!! And as it's a special day, I opted for frying a local duck egg. 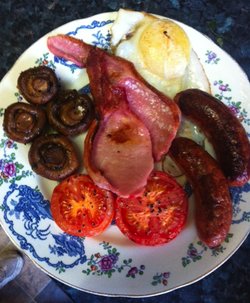 So, what's the story behind the Great British fry-up?! The full English breakfast traditionally comprises several fried foods, usually including bacon and eggs. The name "bacon and eggs" was popularised by Edward Bernays in the 1920s. To promote sales of bacon, he conducted a survey of physicians and reported their recommendations that people eat hearty breakfasts. He sent the results of the survey to 5,000 physicians, along with publicity touting bacon and eggs as a hearty breakfast. Sausages - I bought these from Kelsey's Farm Shop in Bexley - they were made, and the animals reared by Court Farm - producers based in Rochester, Kent. The sausages were delicious. Good flavour, and a firm texture. Unsmoked back bacon - Local kent bacon, purchased from a great butchers called J Par & Co family butchers (1 Coney hall Parade, BR4). A little on the salty side, but nice thick slices and a good layer of fat around the edge to crisp up under the grill! Duck eggs - Bought from Kelsey's Farm Shop in Bexley, and supplied to them by local producers. It's great in the shop, because they have pictures and information up on the wall of all local suppliers, so that you know exactly where everything's come from. 2. Place the mushrooms, whole in to a baking dish, and drizzle with lots of olive oil and some fresh thyme. Place in the oven, next to the sausages on the top shelf for 20 minutes. 3. Place the tomatoes on to a baking sheet and drizzle with some olive oil, salt and pepper. Place on a lower shelf in the oven for 20 minutes. 4. Grill the bacon 5 minutes before dishing up on both sides until it's nice and crispy. 5. Just before serving up the rest of the food on to nice hot plates, fry the egg in a non stick frying pan until the whites are cooked and the yolk is nicely runny. Enjoy with plenty of crusty white bread, tomato sauce and a good cup of British tea.